The Advanced Analysis Facility has played a supporting role at University of Wisconsin-Milwaukee in graduate and undergraduate academic research for nearly 25 years. With expertise achieved across several disciplines from years of experience, the AAF staff is happy to discuss research efforts and instrumentation capabilities with students. 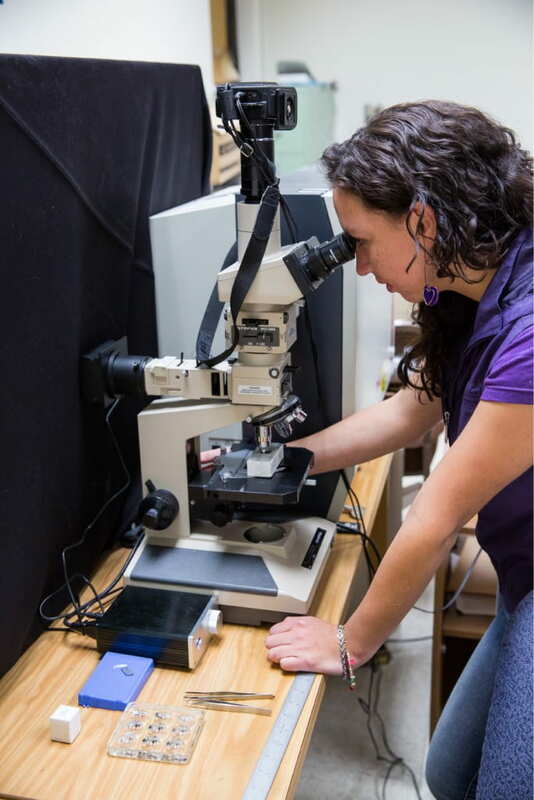 The AAF’s laboratory serves as a “home away from home” for graduate students conducting work outside of their individual group research labs to collaborate with researchers from various disciplines. In addition to advanced research instrumentation, the AAF also includes sample preparation facilities, fume hoods, lab ovens, glassware for chemical preparations, balances, optical microscopes, and a refurbishing room with drill-press and other tools. Graduate students are encouraged to consult AAF staff on instrumental methods and sample preparation or other research inquiries. To increase your knowledge of materials characterization and the science behind the instrumentation at the AAF, consider taking UWM graduate course MSE511 Advanced Materials Characterization. Undergraduate students at UW-Milwaukee are able to secure part-time positions as undergraduate researchers within the College of Engineering & Applied Science, Physics, Chemistry, or Biology while earning their degree. These positions allow students to work alongside and learn from graduate students in their field of study. Often, undergraduates conduct similar work to graduate students and may earn the same user privileges at the AAF–a rare opportunity in a university. In addition to undergraduate research the AAF also supports undergraduate engineering senior design projects via instrumentation training and guidance. Student groups work together with one or more instruments to collect the data needed to facilitate their engineering design project. Senior design project concepts are brought to the university by area companies and aim to solve real-world engineering problems.